Since James Thompson Smith's founding of the family business in 1886, four generations have humbly served families in the surrounding community. His son, Earl T. Smith, grandson, L. W. "Bobby" Smith, and Bobby's daughter and son-in-law Philip and Martha Smith McQuiston continued their local family ownership for 119 years until October 2005. Keith and Tricia Webster purchased the funeral home in October 2005. A licensed funeral director since 1986, Keith's interest in funeral service dates back to 1970 when he would occasionally notice funeral cars in a neighborhood church parking lot. After experiencing several deaths ranging from his maternal grandparents to a high school classmate, Keith stood on the porch of Smith & McQuiston Funeral Home in 1981 and set a goal to become a funeral director. After graduating Northeastern High School in 1983, Keith attended Vincennes University and earned an Associate of Applied Science degree in 1985. He served families in Indianapolis and Madison, Indiana, often turning to Phil for his mentoring advice. In 1996, Keith founded Morgan-Webster-Nay Funeral Home in Madison, which quickly became established as the leading funeral home in that community. As successful as he was, Keith lamented that the opportunity to serve families in the Fountain City area had eluded him. An interesting series of events, occurring from July-September 2004, led Keith to visit Phil. A discussion of ideas began that would culminate 11 months later, when Keith's dream would come full circle. It is our goal to carry forward the legacy of personal service established by the Smith and McQuiston families over the years. Using modern technology and good old-fashioned attention to detail, we will strive to earn your confidence in us by treating families the way we think we would want to be treated. Keith and Tricia have established their home next to the funeral home. You'll often drive by and see one or both of them working in the yard or sweeping the curb. In 1828 Solomon Woody, the man who would in the future build the house that is today used as Smith & McQuiston Funeral Home, was born to Joseph and Rebecca Leverton-Woody. He grew up just northeast of old Newport, Indiana. In 1850, Solomon Woody left home with a group of men to go to California in search of gold during the Gold-Rush time period. He returned to Cincinnati (not Newport) where he worked for Levi Coffin**. In 1868 Solomon returned to the town of Newport, newly wed to Rhoda Alice Huff. 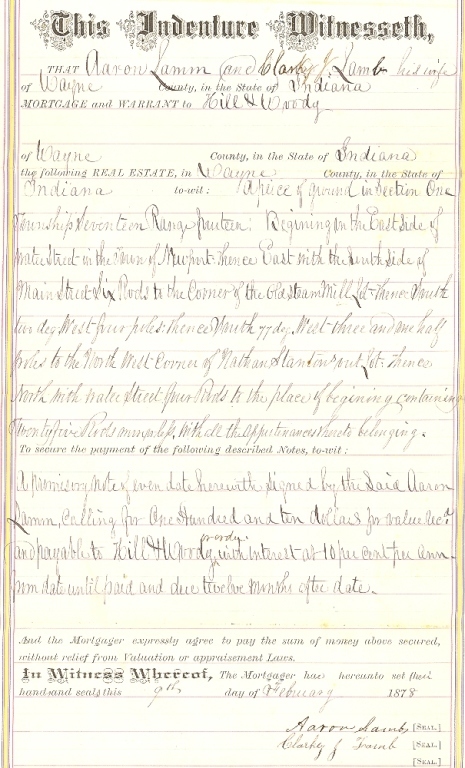 It was at this time that the two of them purchased the same plot of land that the funeral home sits on today, from a man named George Hartley. On this land, they built their home, the northernmost part of which was actually part of Levi Coffin's general store moved down from uptown. The southernmost part wasn't added on until 1882. In their home, Solomon and Alice opened their own store and called it "Hill & Woody". It offered dry goods, as well as Sol's tailoring trade. Another talent of Solomon's was painting; at times he and famous painter Charles Conner++ worked together. 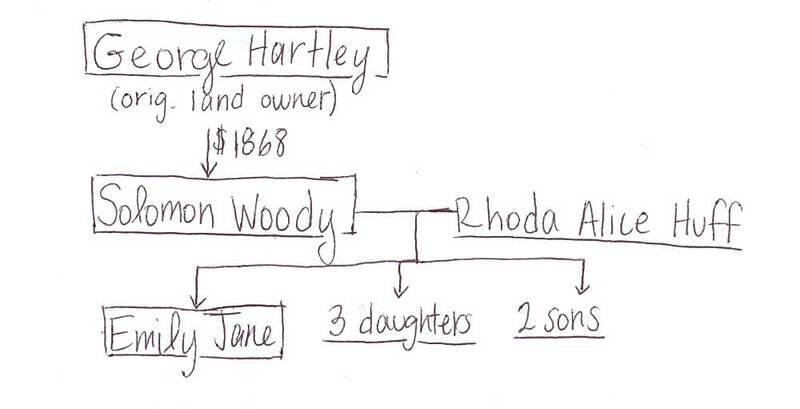 Solomon and Rhoda Woody had four daughters and two sons from their marriage. One daughter, Emily Jane Woody, would grow up to marry the son of Newport's first funeral director, James Thompson Smith. 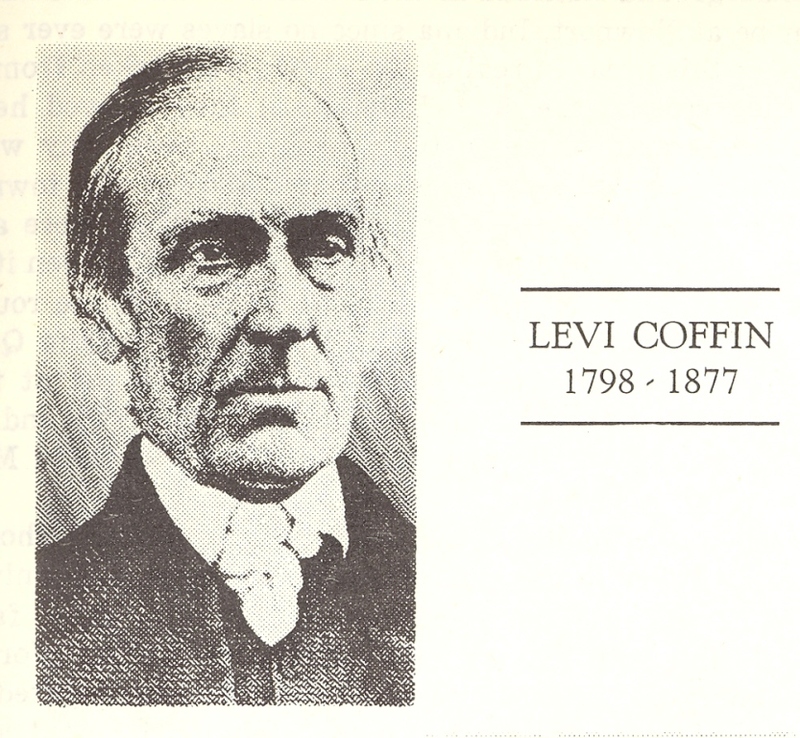 **Levi Coffin, famous mostly for the time in his life when his house was the Grand Central Station of the Underground Railroad , was first a store owner. In 1826 he opened a general store at the north end of Newport, where he ran a pork-cutting and tailoring business as well as selling groceries. He would ship his pork to Cincinnati, and the stores in Cincinnati would then send him his groceries in return. 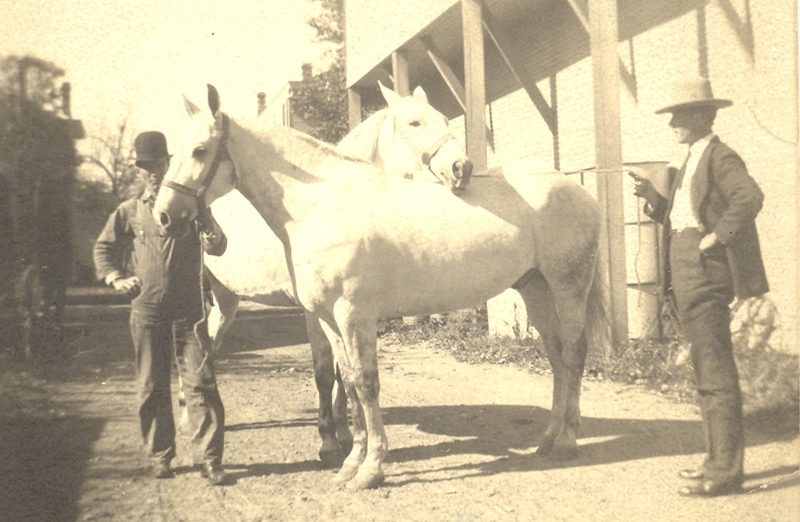 ++Charles Conner once made the horse stable behind Solomon's house (now a garage) the subject of one of his paintings. The painting used to be displayed at the Richmond Art Museum. In 1886, James Thompson Smith was the only funeral director in Newport. However, his place of business wasn't where Smith & McQuiston Funeral Home is today; his funeral home was on another plot, and the present-day Smith & McQuiston Building was still being used as a house. Even though there is still only one funeral director in Fountain City, the times have changed vastly since James T. Smith operated his business. Today, the hearse used by all funeral homes is an automobile, but in 1886, hearses were horse-drawn. ** Another difference that illustrates the times is how a funeral home was operated in general. Funeral Directors were then called "undertakers", and they really didn't use their business' building for the service they provided for a while. When a death happened in the home, the undertaker went to the deceased's home and used a "cooling board"++ to embalm the person right in their house. Today, such practices would be considered very taboo by many families. Also in the year 1901, James Thompson Smith passed away. His passing led Earl to return to Newport that same year, so that he could continue his father's business. In 1902, E.T. 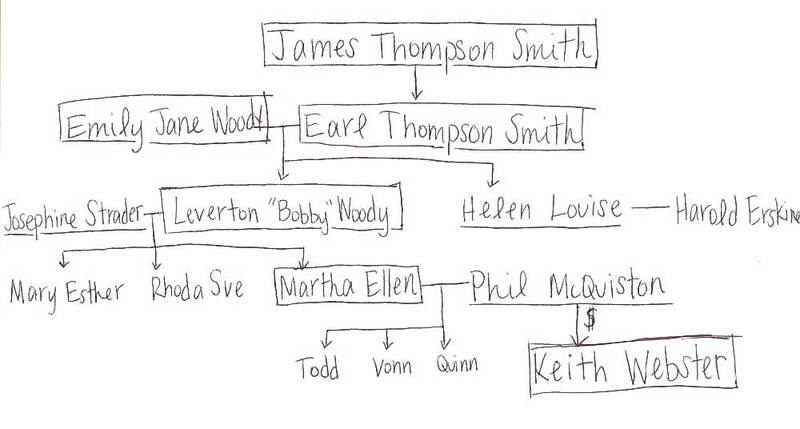 Smith married Emily Jane Woody. This is how these two families were first united. **Horse-drawn hearse equipment was used until 1911. The last horse-drawn hearse used by James Thompson Smith is on display at the Wayne County Historical Museum. ++"Cooling boards" were used until 1911 as well. These were basically portable embalming tables that could be easily transported and carried into a deceased's home. ^^An undertaker only needed an embalmer's license to operate a funeral home back then. They were required to also have a funeral director's license starting in 1934. Earl Thompson Smith, along with his new wife Emily Jane, continued to run his father's funeral home at its original location. 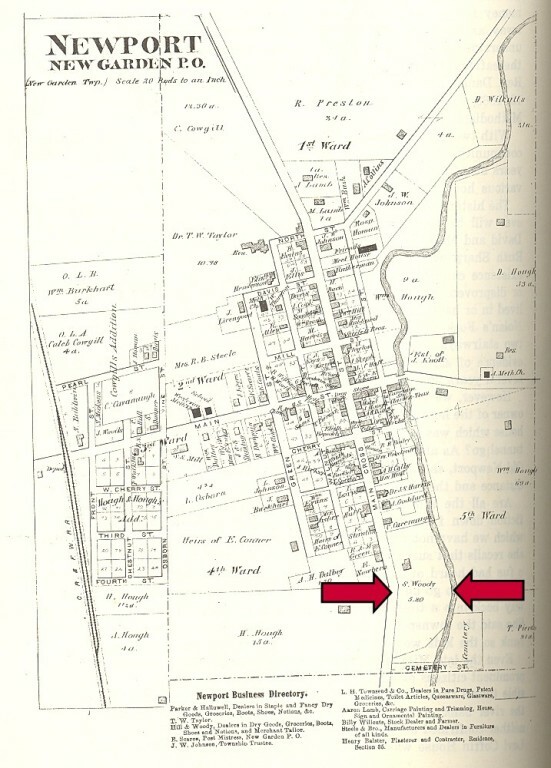 In 1904, the married couple had twins: Leverton "Bobby" Woody Smith, and Helen Louise Smith. Leverton Smith becomes a key part of the history later on. 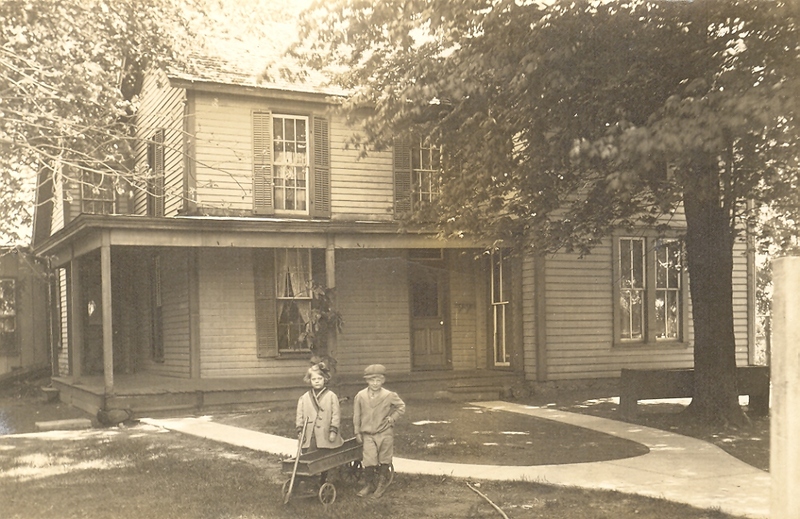 Earl and his family lived at their own home until 1907. 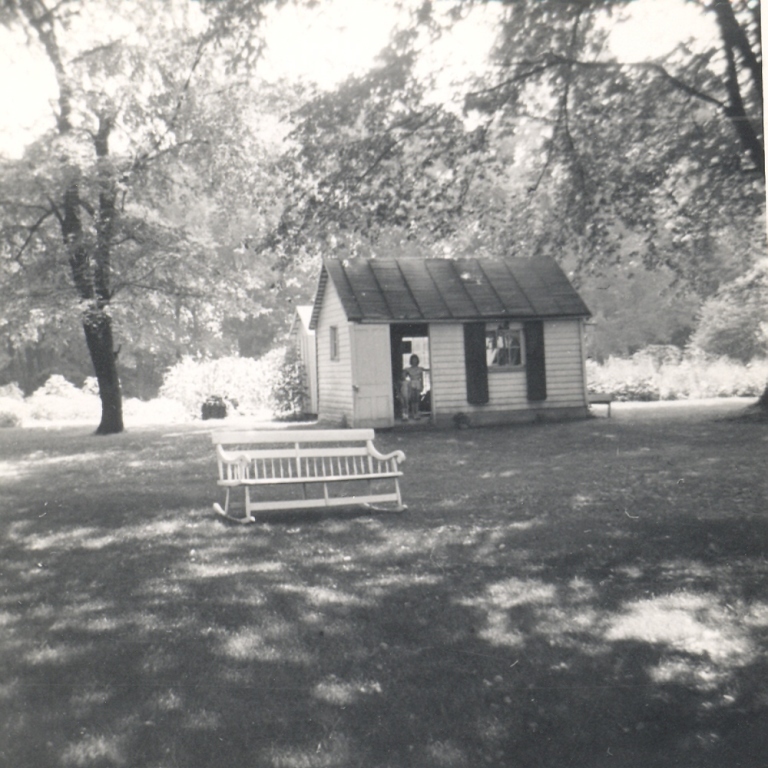 In this year, the family moved in with Emily's widowed mother Rhoda Woody, who was living alone in the Sol Woody house. During this time, Earl Thompson Smith continued his father's business in serving the people of Newport. Along with that responsibility, E.T. also established a couple of other partnerships with Richmond businessmen. ** Mr. and Mrs. Earl Smith lived in the Sol Woody house for many years. From 1918 all the way through 1928, Earl Thompson Smith had a business partnership with Ed Klute of Richmond. The two of them ran Klute & Smith Funeral Home in Richmond. After that partnership ended, he became a partner in another Richmond funeral home, Pohlmeyer, Welfer, & Smith Funeral Home. E.T. worked there until 1934. Bobby lived at Smith & Son Funeral Home until 1939, when he married Josephine Strader. They built a new home to the South of the funeral home where his parents remained. Leverton's twin sister Helen Louise also married in this year. **As mentioned earlier, it was this year that all funeral directors had to attain both of these licenses to operate an undertaking business. ++Recall that up until now, embalming was done on the aformentioned "cooling boards" in the deceased's home, and no preparation room had been required. While Leverton continued to work at Smith & Son Funeral Home, he and his wife Josephine started their own family in 1942 with the birth of their first daughter Rhoda Sue. The following year they had Martha Ellen, and in 1947 they had their youngest daughter Mary Esther. 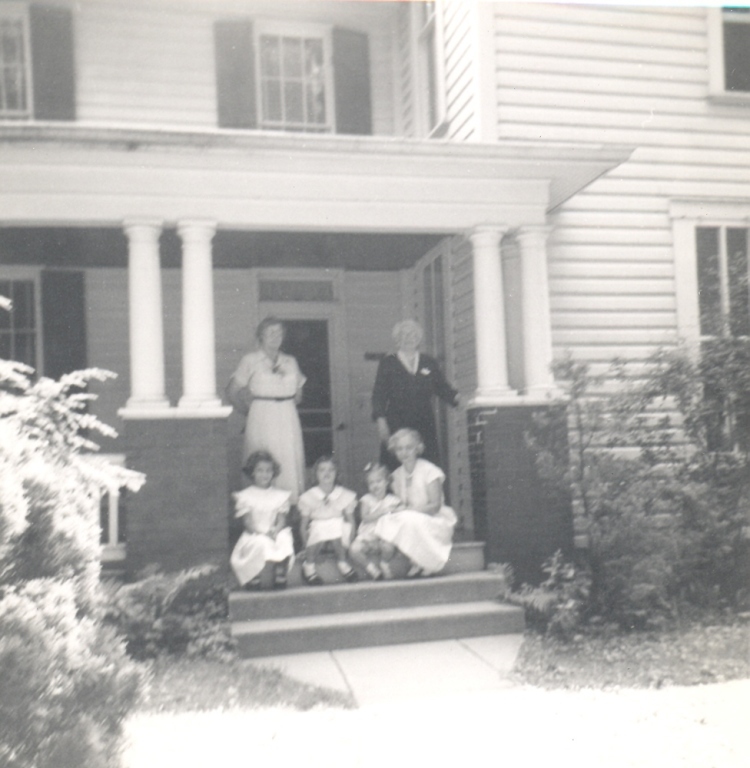 The three girls grew up next to their grandfather's funeral home, enjoying the land on the same plot that was bought from George Hartley just less than a century before. One daughter, Martha Ellen Smith, would eventually grow up to marry the next owner of her family's funeral home. The daughter mentioned in the previous page was Martha Ellen Smith, who married Phil McQuiston in 1964, two years after the death of Martha's grandfather Earl Thompson Smith of Smith & Son Funeral Home. Phil came to Fountain City in 1964 fresh out of Indiana Mortuary College, and entered an apprenticeship with Martha's father Leverton Smith at Smith & Son Funeral Home. After three years of working as an apprentice, Phil then partnered with Leverton in 1967 and the two of them owned and operated the same Smith & Son Funeral Home. The name didn't change to include Phil's name until three more years later in 1970. 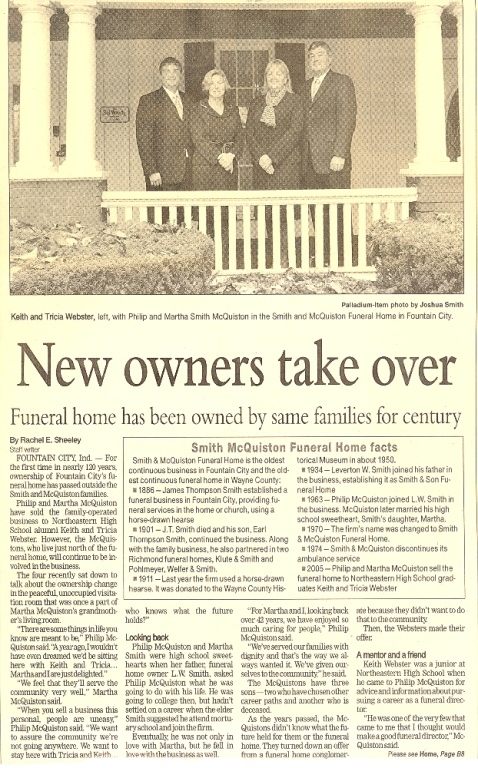 The name Smith & McQuiston Funeral Home is what the business is still operated under today. After Martha Smith married Phil McQuiston in 1964, the two bought the house on the North side of the funeral home. Here, they decided to start a family of their own. In 1967, the first of three sons was born, and they named him Todd Robert McQuiston. Their second son, Vonn Woody, was born in 1969. Their youngest son, Quinn K., was born in 1970, but unfortunately passed away in 1978. Phil McQuiston, once he was the owner, not only changed the business' name but also helped add on a funeral chapel in 1964, during his time in apprenticeship with Leverton Smith. He worked at the funeral home for a total of 51 years before retiring. The funeral home then changed families once more. 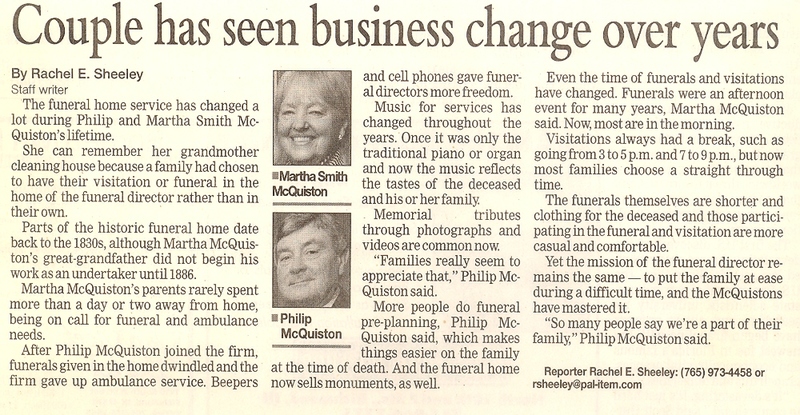 In 2005, Phil McQuiston was ready to retire and pass on the funeral home to someone else. Keith Webster was the one to take the opportunity. He would also be the first business owner who wasn't connected to the original Smith family. Keith Webster grew up on a farm on Tingler Road in Richmond. He was born in 1964, the same year that Phil McQuiston started working at Smith & Son Funeral home. Keith graduated from Northeastern High School in 1983, going on to Vincennes University to attend its mortuary school. The career path was inspired by his attendance at funerals growing up, many of them at Smith & McQuiston Funeral Home. He graduated from Vincennes University's mortuary school in 1985, and returned to Richmond. In Richmond again, Keith was an apprentice at Stegall-Berhide-Orr Funeral Home for one year, and then continued to work there for another two years. Following that , he moved to Indianapolis where he worked part-time at a funeral home on the South side. During this time he also went to IUPUI for ROTC training. In 1991, Keith moved South from Indianapolis to Madison, Indiana. There, his first job was at Lytle Funeral Home, where he worked for only 90 days. After his time there ended, he worked at another Madison funeral home, called Vail-Holt Funeral Home. He worked there for a total of three years. After much experience at working at other funeral homes, Keith decided to start one of his own in Madison in 1997. It was called Morgan-Webster-Nay Funeral Home. This business is still a growing funeral home today, although the name has since changed to Morgan-Nay Funeral Centre. 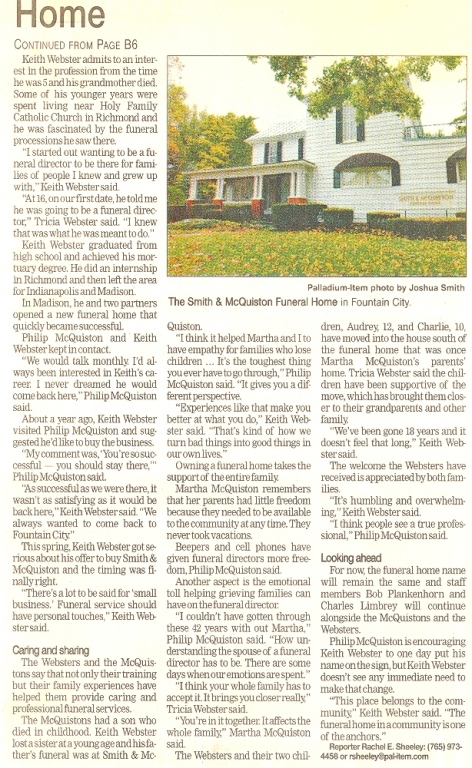 The opportunity to buy Smith & McQuiston Funeral Home came to Keith in Madison by word-of-mouth. Keith knew it was a special, once-in-a-lifetime opportunity. He had grown up in the area and knew its history and families from his childhood. The rarity of it all was enough to lead him and his family to move back to Fountain City. The Webster family now lives in the McQuiston's old home that was to the North of the funeral home. The Smith-McQuiston & Webster Funeral Home has a very long history. It is likely to have a very long future, too. The building itself has withstood the forces of nature for more nearly two centuries and it's still structurally sound. 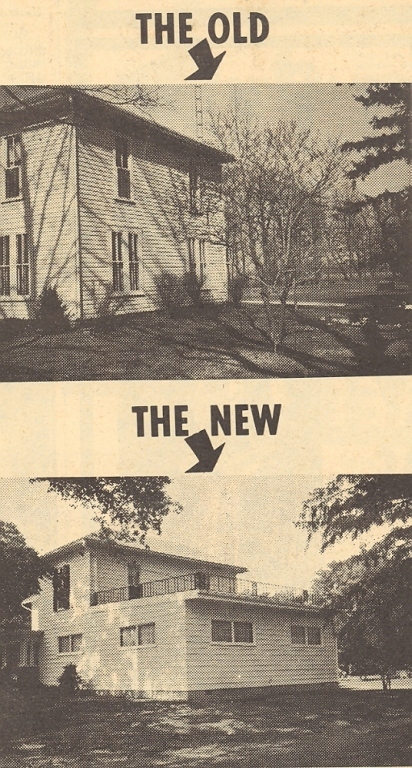 There have been only aesthetic changes made since the funeral chapel addition of 1964. The only other true change has been the business' name. 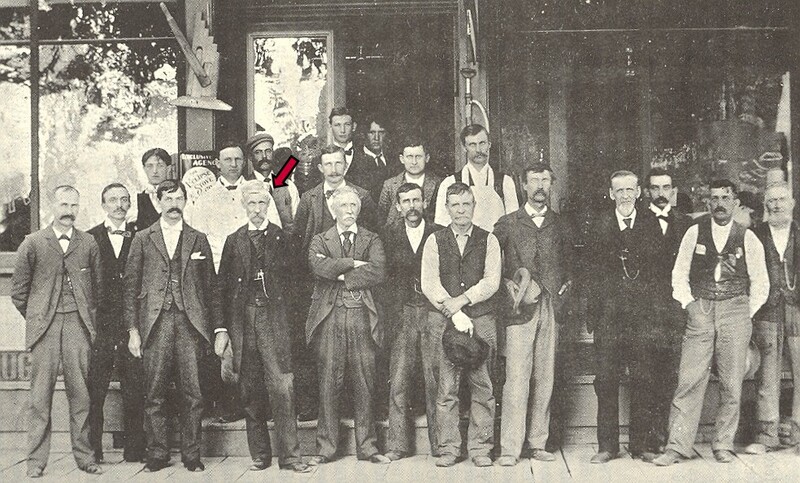 It all started with James Thompson Smith and Smith Funeral Home. Then, it was Smith & Son Funeral Home and later Smith-McQuiston Funeral Home. Since 2017, it's been Smith-McQuiston & Webster Funeral Home. As Fountain City's funeral home we'll strive to keep doing what we have been doing for over 125 years for years: serve families who place their confidence in us.